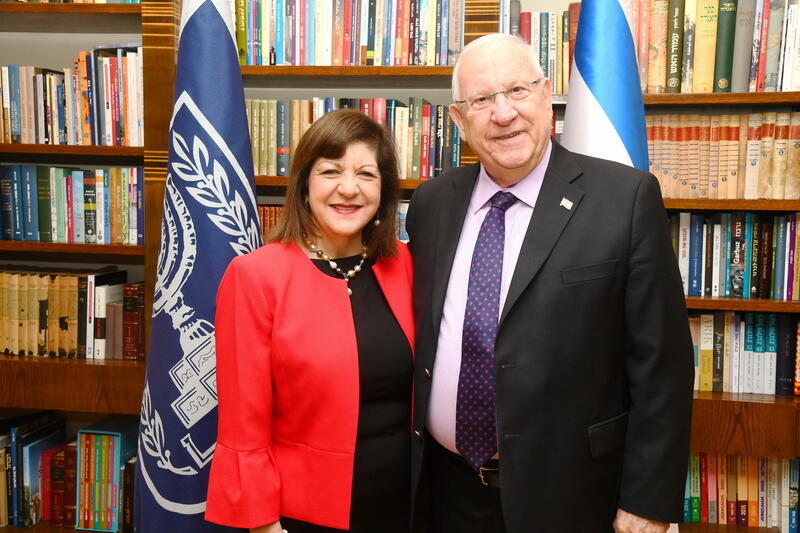 Sunday, October 7, 2018, the President of the State of Israel, Mr. Reuven Rivlin and his wife Nehama, announced the kick-off of the Israel Cancer Association’s 2018-2019 Year of Activity. The moving ceremony was held at the President’s Residence in Jerusalem with child cancer patients in attendance, and representatives of ICA volunteers from its branches throughout Israel. The event also featured a performance delivered by the singer Ruhama Raz who coped with cancer and Asil Abu A-nil, who recounted how the Israel Cancer Association enlisted her support in the fight spearheaded by the ICA. Dr. Margaret Foti, the CEO of the American Association for Cancer Research (AACR) has honored us with her presence. Dr. Foti arrived to participate in the joint AACR, EACR and ISCR conference. Good evening, everyone. Thank you so much Miri for your warm introduction. It is really wonderful to be here in Israel! I am deeply honored to be present at the spectacular Beit HaNassi Residence of the esteemed President of Israel. My sincere appreciation goes to His Excellency President Rivlin and First Lady Nechama Rivlin for this special invitation and for giving me the opportunity to share some remarks about the progress being made today against cancer. First, I want to express my sincere and heartfelt appreciation to my dear colleague and friend, Miri Ziv, who has served with distinction for several decades as the Director General of the Israel Cancer Association and who is one of the most influential ambassadors against cancer in the world. Miri was lauded in 2015 for her amazing work with the American Association for Cancer Research Award for Distinguished Public Service and Global Impact in Cancer Advocacy. Because of her sustained, passionate commitment and contributions to international cancer research and advocacy since she assumed her important role at the Israel Cancer Association, she has saved an incalculable number of lives in Israel and, indeed, all over the world. And even when she experienced the personal devastation caused by cancer—that is, of losing her 21-year-old son to melanoma and her brother to hepatocellular carcinoma—she continued forcefully to further the goal of markedly reducing cancer incidence and mortality through cancer research, early detection, and prevention. The world is indebted to Miri Ziv for her extraordinary leadership! In closing, I want to thank you for your kind attention and to again extend my profound appreciation to His Excellency and the First Landy for their invitation to be here today at this beautiful residence. It is truly a special honor for me! Thanks again!